The only thing better than building edible structures is building them with a group of amazing people. 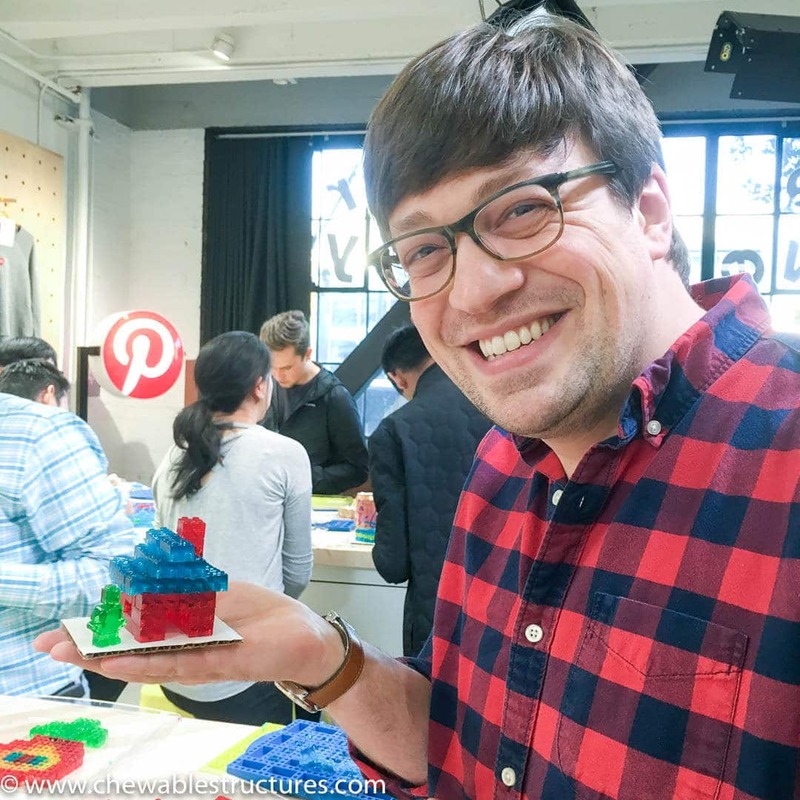 Last month, I had the unique opportunity to teach a fun class at the Pinterest Workshop, a newly launched creative studio housed in their San Francisco headquarters. The Workshop was filled with Pinterest engineers, data scientists, and product managers. I’m teaching Pinterest employees how to make gummy candy. It’s super fun and easy! If you’ve met me in person, you know that I can’t resist building a watermelon fruit train, the Family Guy House using caramel popcorn, and a blueberry Eiffel Tower. After all, I always say, “Why cook when you can build your food!” If you’re unfamiliar with my obsession about building fun food crafts, you can see it in action in my latest trailer below. 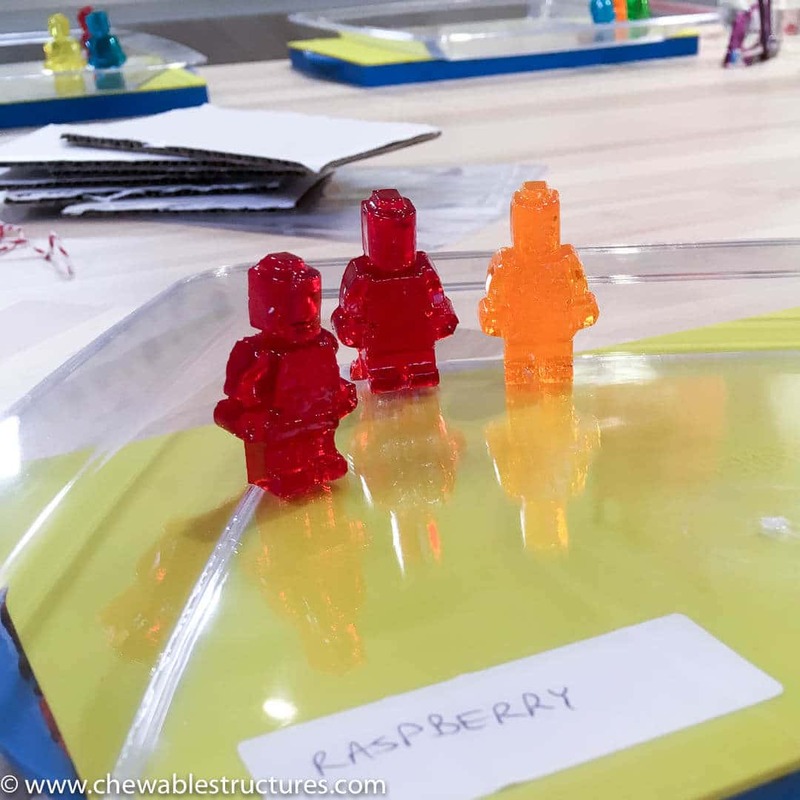 WATCH THE VIDEO TRAILER BELOW to learn more about Chewable Structures. 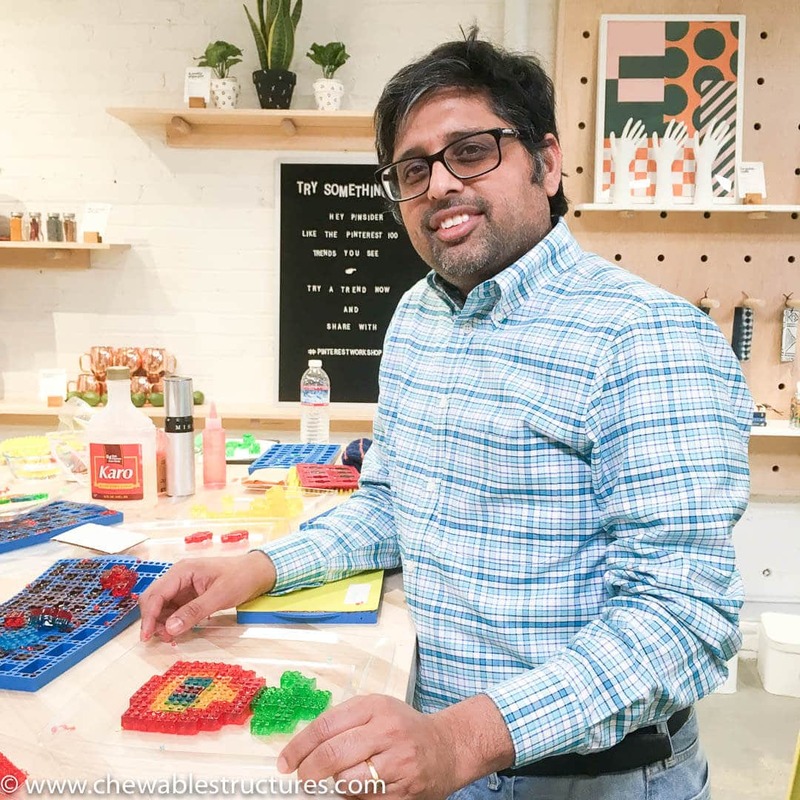 That’s why I wanted to bring my passion for playing with my food to an interactive one-hour class where I taught fellow builders how to construct one of my favorite Chewable Structures, a DIY Stackable JELLO gummy brick pyramid and this gummy LEGO Candy Christmas tree. I kicked off the class by performing a short demo outlining the blueprint of how to prepare the gummy liquid. Since I prefilled 25 of The Modern Gummy molds at home (that’s a lot of gummies! ), participants were able to dive in right away. They built creative and tasty structures that they either munched on during the class or took home for bragging rights. 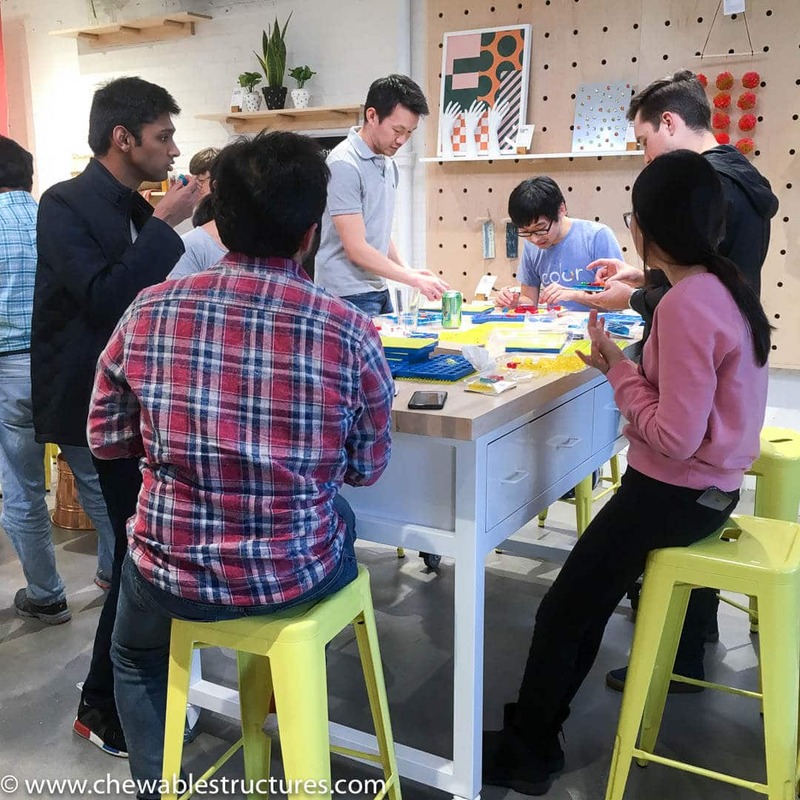 It was a lively and creative afternoon building Chewable Structures at Pinterest. I want to give a special shout out to Lauren Michaels and Aimee Bidlack for organizing this awesome event. 1. It’s Fun To Play With Your Food At Work! 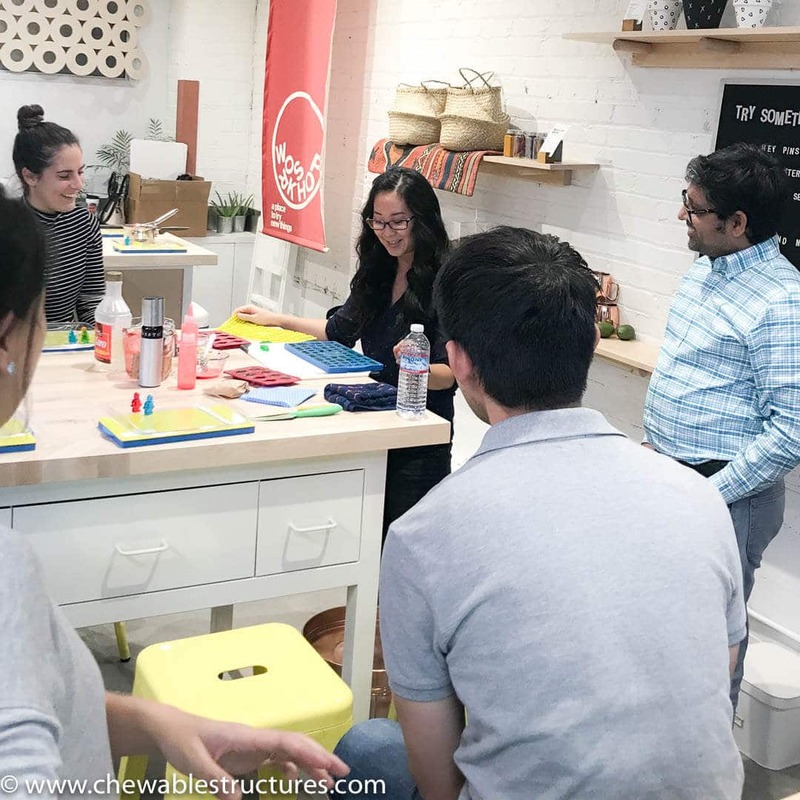 Knowing that this class was filled with food enthusiasts, I had high expectations that they would design fabulous Chewable Structures. And, they exceeded my expectations. Here’s a peek at a few of their delicious masterpieces. Check out this adorable raspberry and berry blue “brick” house designed by Brian. It was chilly outside, so he even constructed a three-layered roof topped with a chimney. Even the lime-flavored gummy person can’t wait to get inside! 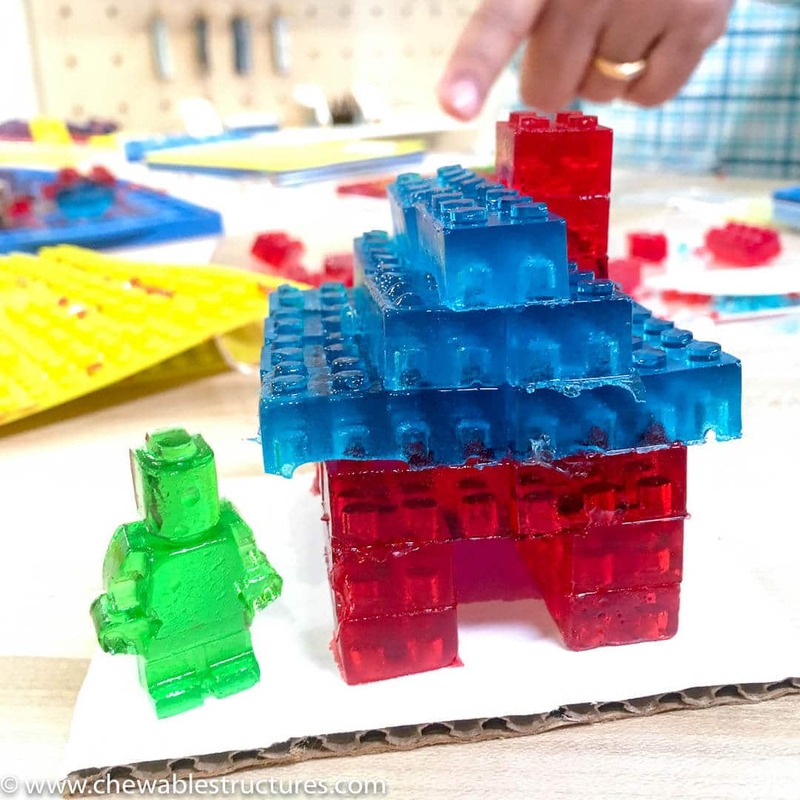 Brian is designing an adorable stackable gummy house. 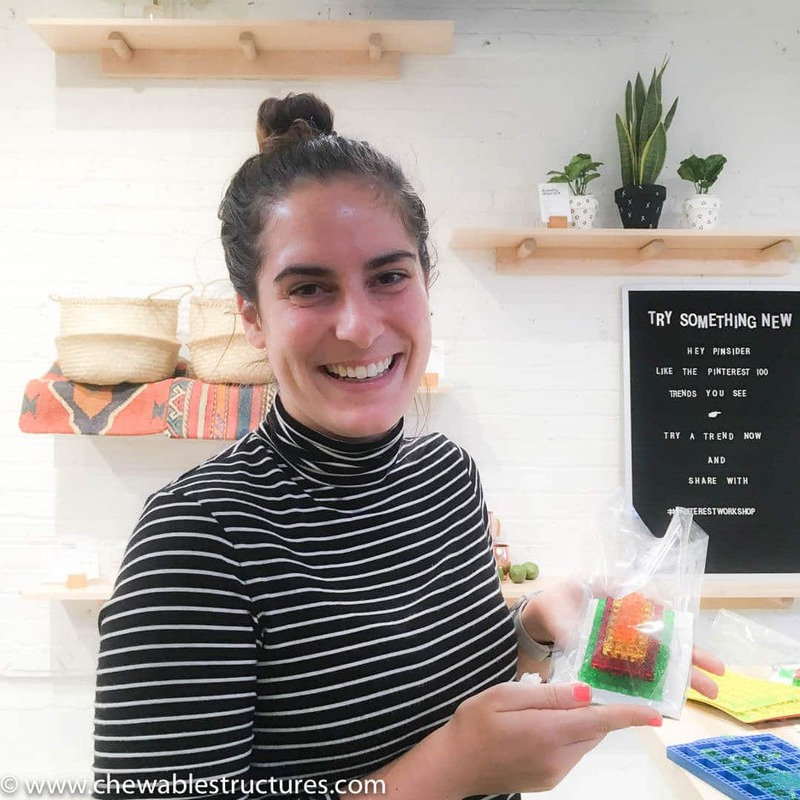 This gummy house is structurally sound, looks great, and tastes yummy. In the spirit of the “Try Something New” sign in the Workshop, Christina designed a colorful four-story pyramid. 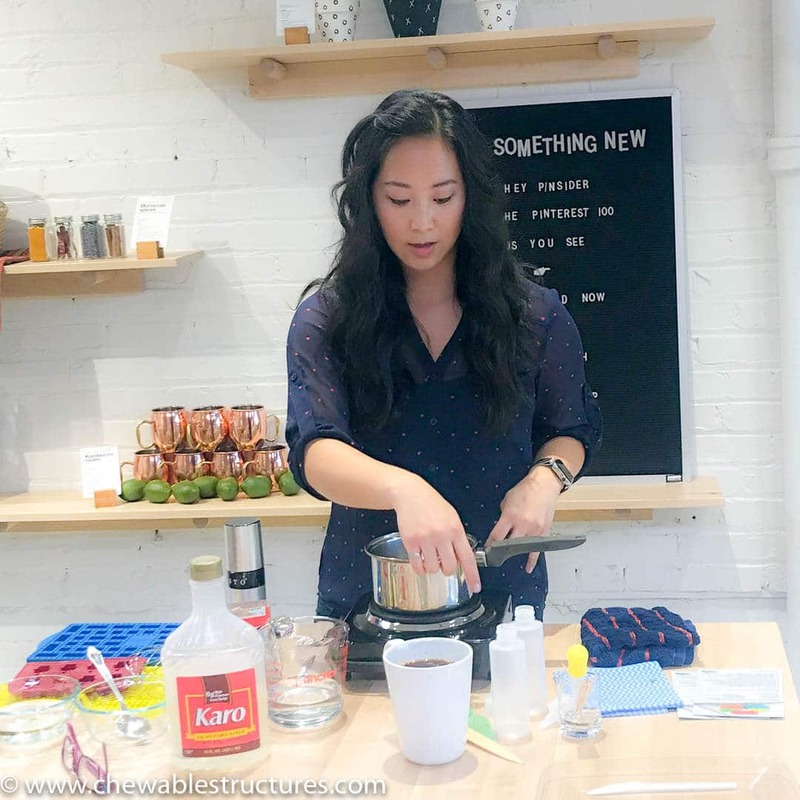 She incorporated some of the liveliest JELL-O flavors, including island pineapple, apricot, lime, and black cherry. Plus, it’s wrapped in a clever gift bag ready to go. Christina is building a colorful pyramid made of tasty JELL-O flavors. Balaji unleashed his creativity by building a two-dimensional fire flower. I love playing Super Mario Bros, but devouring this yummy fire flower is even better! Balaji is building a fire flower. 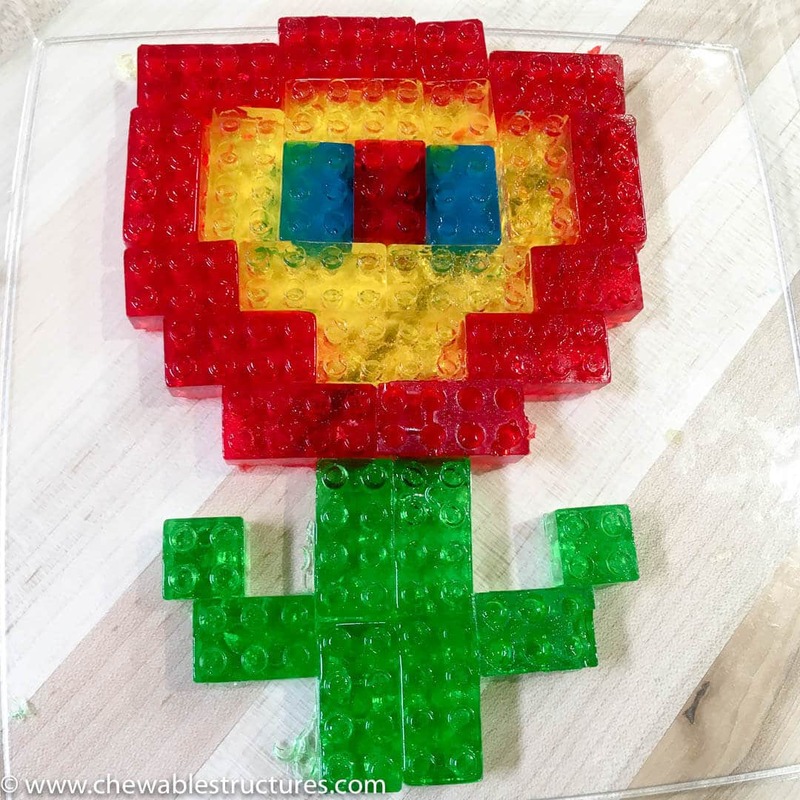 A tasty version of Super Mario Bros’ fire flower. As a kid, my favorite subject was math. To me, math was visual, logical, and delicious. This is probably because my teacher taught us how to count using food. As an adult, I can barely remember what I had for lunch yesterday. But, I can still hear the crunch of each Cheerio as if it were yesterday. This vivid memory laid the foundation of my love for math because it was fun, relatable, and edible. Food is ingrained in our everyday lives and playing with food is entertaining. That’s why I think building creative edible structures is a great team building activity at work. 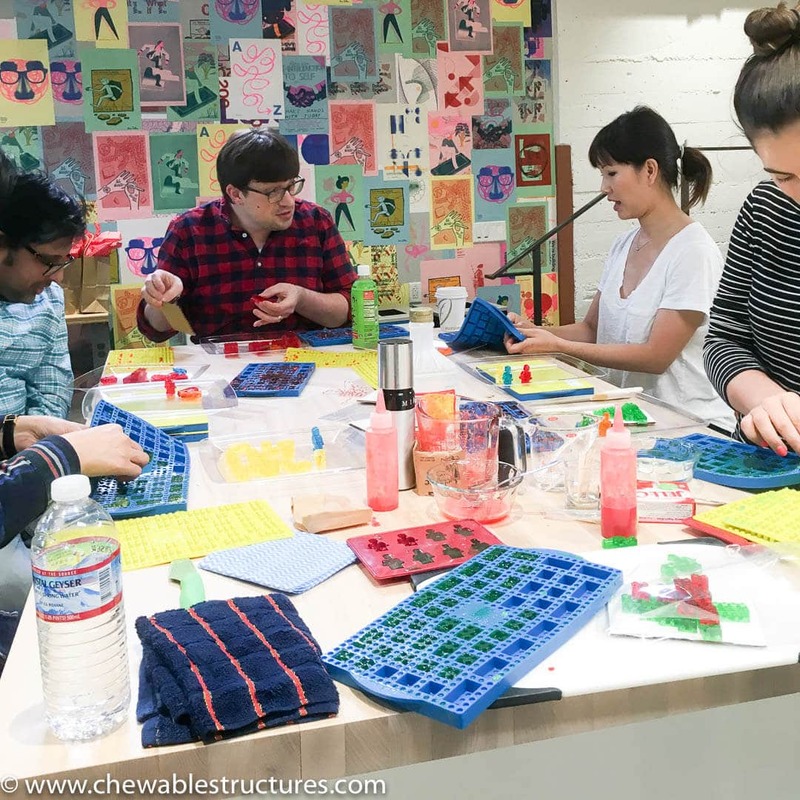 Building Chewable Structures could help spark creativity, bring people together, and most of all create fun memories. See, even these gummy people are having fun! 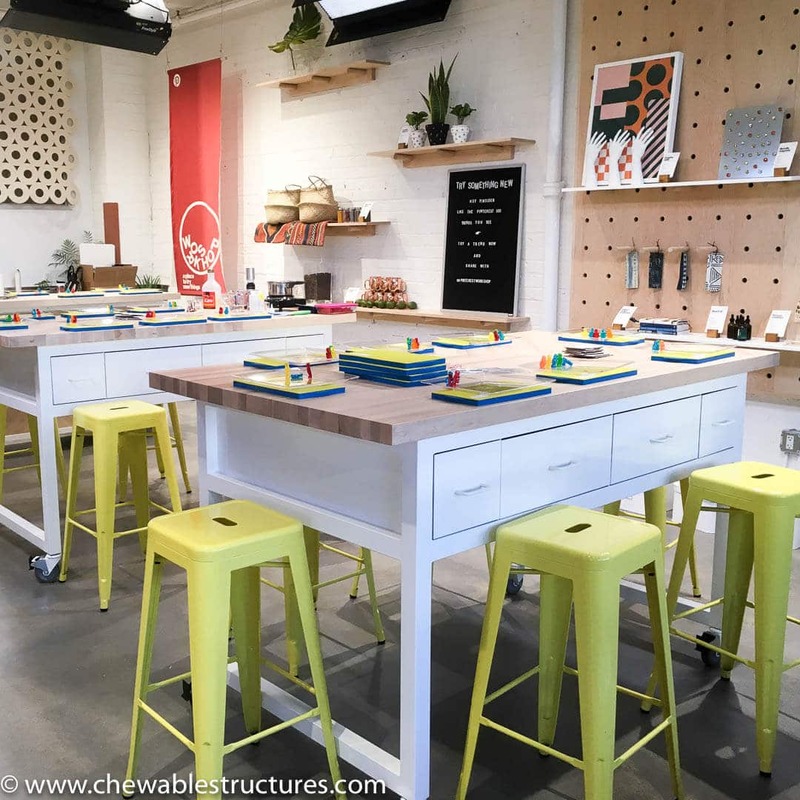 Last November, Pinterest launched the Workshop with the mindset that “making something by hand is powerful.” This resonates with me because this is a large part of why I created Chewable Structures. To me, the journey of crafting something with my own two hands is more meaningful than the finished product itself. Inside the Workshop, the Try Wall is adorned with handpicked projects that are trending in the food, home and style categories. If you’re also looking for inspiration to fill your 2018 editorial calendar, last month Pinterest published their 100 Top Trends to Try in 2018. I’m a sucker for a good French fry, so I’m pretty sure I’ll be checking out the air fryer trend for a healthier alternative to deep frying!